This week I am off to Shetland, officially the farthest north I have ever been* - we're talking 60 degrees of latitude here - we're talking level with Hudson Bay, the Kamchatka Peninsula, Greenland ... I am the extremely grateful and more than a little over-excited guest of the Farlin Project** and will be reading at the Bonhoga Gallery on Friday at 7:30. So if you're anywhere near, drop by and say hello. For the rest of you, you'll have to wait till I'm back south again to find out how it went. *Okay, the farthest north I've ever been while in actual contact with the ground. Airplanes don't count. 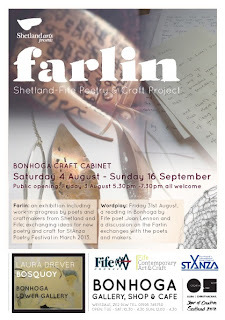 ** The joint brainchild of Shetland Arts and Fife Contemporary Art and Craft, pairing poets and makers, and then waiting to see what happens! I hope to have photos of the interim work on display at the Bonhoga Gallery as part of the Wordplay Book Festival. 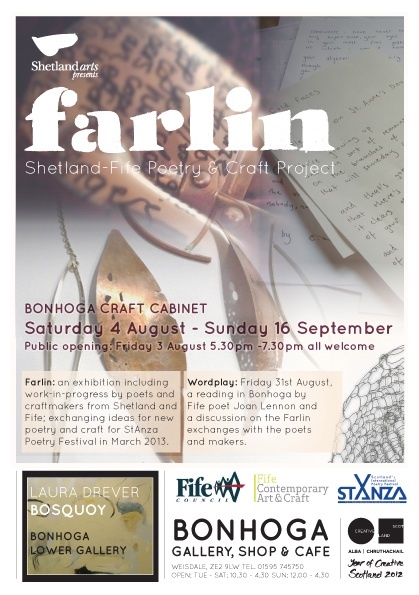 The project will end at StAnza, Scotland's International Poetry Festival in St Andrews in March 2013. So I'm going to blog without images. This week (and I am reluctant to say how many weeks previously) I have been wrestling with the mound of wordage that is Part 2 of the work-in-progress, Silver Skin. And I had a sort of breakthrough. I realised that the reason it wasn't working was - it was in the wrong order. I needed to re-jig. Change the chapters round. Make a mess. That's what I needed to do, scary as it seemed. And it is. A mess. It's better - it's so much closer to being right - but it's also untidy with a capital UN. Does this mean I will not be meeting my self-imposed deadline of a finished first draft by the 28th of August? That Was A Week, That Was! Last week I was at Moniack Mhor, co-tutoring the Arvon course Writing for Young People - Getting it Flowing with Paul Magrs (guest reader Children's Laureate Julia Donaldson). Yesterday I came home. When I started an email to a friend with the words "Hi! I'm black!" it was a hint I may still not have entirely returned to normal, however. I've made no attempt to unpack, ferret out dirty laundry, organise my notes. Yesterday I had an afternoon nap and can't exactly tell you what I did with the evening. * Today I had a morning nap AND an afternoon nap and seem unable to correctly remember the names of my children. It was a blast! One of the directors said she'd never heard quite so much laughter from a course before. It's true. We rocked. Find me today on An Awfully Big Blog Adventure where I am dispensing good advice. See if you agree! Then it's off to Moniack Mhor on Monday, reporting back here next weekend. Till then - cheers, Joan.